Nothing helps when I’m feeling stuck like shifting perspective. And nothing shifts my perspective like hanging upside down–literally. I practice this several times per week now, and it’s a blessing for my body, mind, and soul alike. 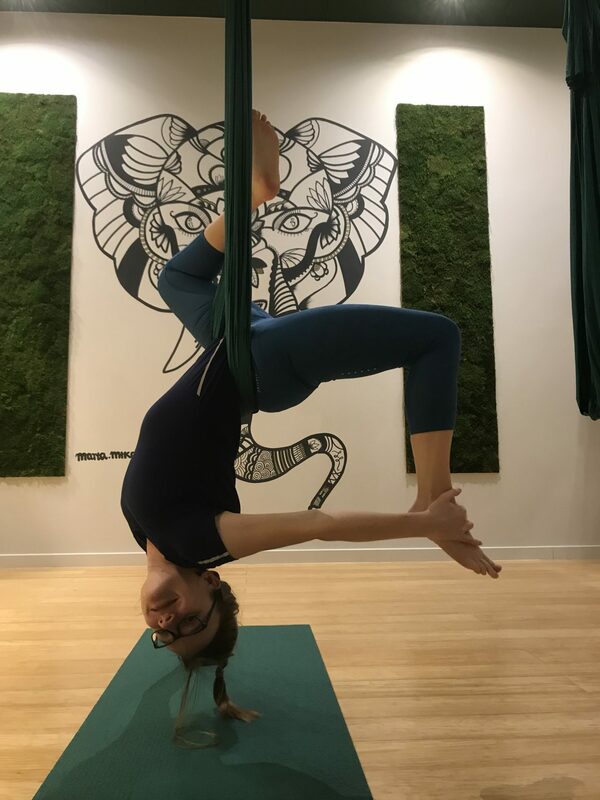 I only discovered aerial yoga about 3 months ago, and it was love at first sight. It’s traditional yoga poses, but taken to an entirely new level (you bet!). With my body supported in hammock I can bend, twist, and fold deeper than ever before. I can slowly ease into positions that would otherwise require incredible strength. I get better at letting go of control, and trusting that the hammock will hold me. I get to meet the super nice people from NAYS yoga studio. But most importantly, I’m discovering that I have superpowers, and can access them consistently whenever I need them. My first contact with the hammock was weird and thrilling at the same time. I found myself hanging in a very unexpected position, and it happened so fast that I completely forgot to freak out. Long ago, when I tried to learn rock climbing, I hesitated a lot before challenging transitions, and when I finally started I’d be anxious and stiff. Here my mind shuts down before it has a chance to feel any fear, and all I can do is to listen to and trust my body. I’m stretching deeper each time and am now more flexible than ever. I gained a lot of strength in my upper body, which was always a weak spot of mine. 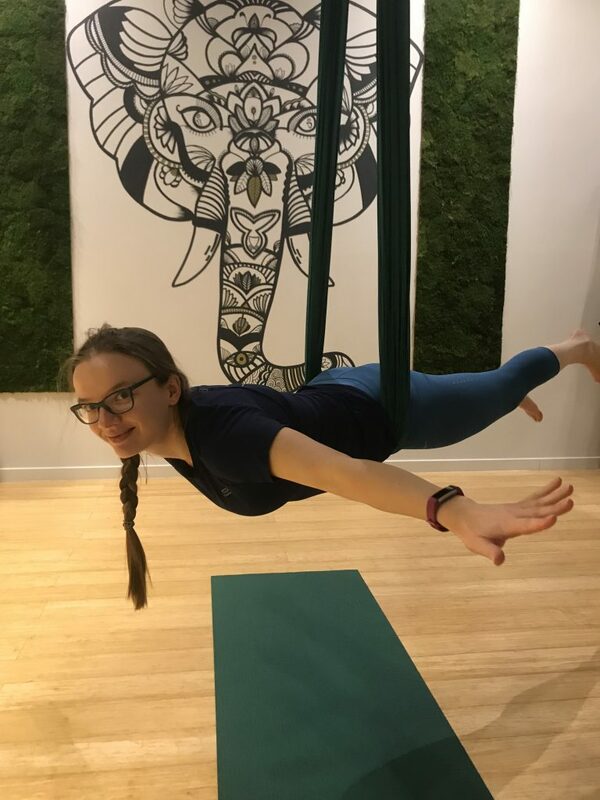 But what fascinates me most is making progress in dynamic balance poses, which depend on the mind as much as they do on the body. Yes, strength is certainly needed to maintain good balance, but the most important element is full, undisturbed attention. It’s just not possible to keep balance and let your thoughts run away at the same time. The moment you start thinking “Yes! I finally got it!”, or comparing yourself to others, is the moment you fall. If you think you will never get into a certain pose, you are right. Some poses you can enter with an empty mind only, and I’m delighted to see myself getting better at this. 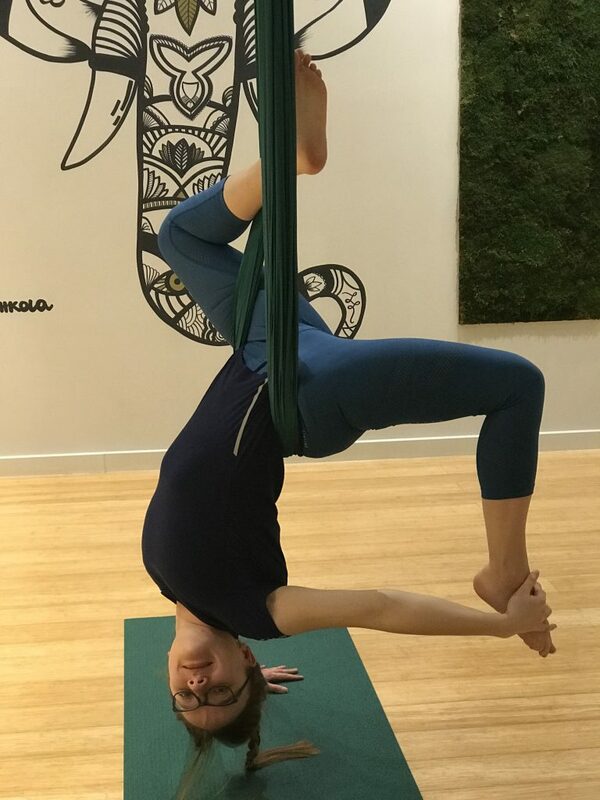 There are many balancing poses you can do in a hammock, but my favorite one is the locust pose. It’s the one where you spread your arms and legs high in the air, supported by just a tiny piece of fabric under your hipbones. I’ve dreamed in my sleep of flying like this ever since I was a child. Given the choice of any superpower, I’d go for this one without hesitation. The first time I saw people balancing in this pose, I was awestruck. I thought it’s just physically impossible to hang like this without extra support. I though I’ll never be able to do the same thing. But one day when trying to let go of my hands and find the balance, I caught myself thinking how impossible it is, and then it struck me. “Do you really want to keep complaining in your head, or will you actually focus on the thing itself? How serious are you?“. The next thing I knew, I was flying. I still get distracted a lot and make the silliest mistakes. I have a lot to learn, and will continue to learn hopefully forever. But I know now that the only thing that stands between me and the seemingly impossible is me not giving it my complete attention. And the more I practice it in the hammock, the easier it gets in real life. Love this ❤ Makes me want to break mine out but it’s below freezing here so I’ll have to wait until my studio’s new space opens and they start their aerial classes 😍 I’m so excited and even more excited now! Wow! That is so cool! I don’t see how it’s possible – yet you’re doing it!